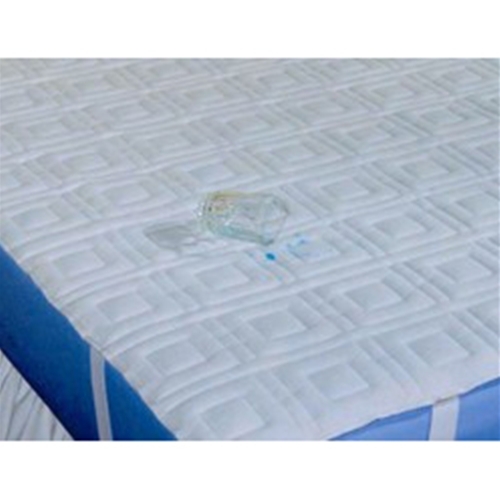 Dignity Washable Waterproof Quilted Sheeting from HealthyKin.com feature soft polyester tops and bottoms with a vinyl center that prevents passage of fluids. I'm very pleased with the quality of these pads. I was a little concerned about just having corner elastic as my husband with Alz does a lot of shifting in bed, but the elastic is extremely strong and holds pad in place very well on xl hospital bed; also very absorbent when liquid gets past disposable pad. Worth the price as I won't be replacing as often as cheap 'waterproof' plastic pads that come apart after a few washings.